today announced the upcoming launch of the American Well 250 Cart, the most comprehensive cart to connect you to the American Well provider network, giving you access to thousands of specialists on demand. This is also the first integrated telemedicine device brought to market by American Well, after merging with Avizia. 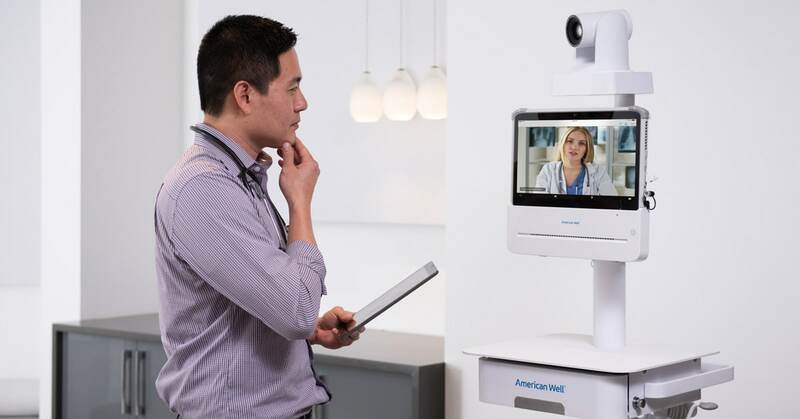 The American Well 250 Telemedicine Cart is an FDA Class I registered medical device that enables access to providers either via the Cloud, beyond a health system’s current network, or the health system’s own providers. Clinicians can start a telehealth consult with one click and integrate peripheral images seamlessly into the telehealth consult. The pan-tilt-zoom camera option on the 250 cart delivers optimal conditions for remote providers to better diagnose and recommend treatment for the patient; and embedded remote monitoring tools ensure the cart is ready for use at all times. Behavioral Health. Patients receiving therapy at a local hospital can connect with a remote psychologist using the 250 cart. Patients and providers save hours of “windshield time” and more patients can be treated immediately, with less wait time. School Health. The 250 cart provides on-demand or chronic care for school children, with the ability for the school nurse to staff the cart and specialized digital equipment – otoscopes, stethoscope – to connect with an experienced remote provider to treat everything from injuries and illnesses, to asthma and diabetes. Students benefit from better access to care and parents don’t have to take time off work to take their children to the doctor. Skilled Nursing Facilities. Skilled Nursing Facilities can use the 250 cart to call in remote providers to treat seniors in their current surroundings, instead of moving them to the ED. The cart can be used for on-demand purposes, as well as for post-acute follow-up care, reducing readmission rates and transfer costs. Patient outcomes are also improved by leaving the senior in their familiar environment, sparing them the ordeal of a transfer. American Well is exhibiting at the 2019 HIMSS Conference Feb. 11-14 in Orlando, Florida. Visit American Well’s booth, #4031, to learn more about our telemedicine carts, solutions and service lines.